In the DICODerm initiative we are trying to adapt the radiology image management tools to dermatology. Recently I came across two articles, that could introduce another dimension to this patronage. One dealt with the Sonography of Acne Vulgaris. (1) The authors conclude ”facial acne vulgaris often involves deeper tissues, beyond the reach of the spatially restricted clinical examination”. However it is important to demonstrate at most the clinical utility of it in the management of acne vulgaris. I feel there is a risk of channeling medically essential services to less critical situation especially in resource deprived areas. 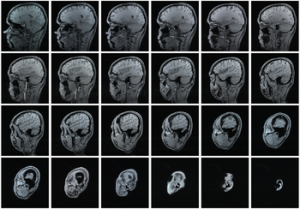 Another article introduces a dynamic new concept of “Microscopic MRI of skin”. (2) Though it is still early times, this could well develop as a “non-invasive” skin biopsy technique, with potential for a huge clinical impact. Hope Dr Laistler and his team can convert their HTS coil into a useful tool in a dermatologist’s armamentarium. (1) Wortsman, Ximena et al. “Sonography of Acne Vulgaris.” Journal of Ultrasound in Medicine 33.1 (2014): 93-102. (2) Laistler, Elmar et al. “In vivo MR imaging of the human skin at subnanoliter resolution using a superconducting surface coil at 1.5 tesla.” Journal of Magnetic Resonance Imaging (2013). Exactly What You Need to Know to Beat Acne! Acne vulgaris affects millions of people and millions of dollars are being spent on management. Nevertheless, failure of treatment is reported in up to 52% of cases. In this first pilot imaging study we demonstrated that acne commonly affects deeper layers (dermis and upper hypodermis), and that subclinical lesions (i.e. not visible to the naked eye of a well- trained physician) were often found. Moreover, acne lesions showed a greater extent and severity on ultrasound imaging. Therefore, imaging and particularly ultrasound might be a reasonable and cost effective manner to assess the anatomical involvement of the condition, and monitor treatment non-invasively in an objective way, which could be critical in difficult cases and trials. Ultrasound is a worldwide available technology, however the dermatologic application of this imaging technique requires machines working with high frequency probes and trained operators (Ref: Sonography of acne vulgaris.J Ultrasound Med. 2014 Jan;33(1):93-102). Many thanks for your comments on our work ! Many thanks Dr Wortsman for your comments and unique insights on the use of sonography in skin disorders. There are basically two types of microscopes, high power and low power. You would use a high power microscope for looking at very tiny things like bacteria, blood cells, life in pond water, cells and insect legs. The low power microscopes are used to look at larger things like a bee, a fly, fabric weaves, coins, stamps and sand grains. All good quality educational microscopes have metal parts and absolutely no plastic parts. Look for metal parts especially in the frame, screw fasteners and focusing system. Otherwise, you are stuck with a toy microscope that you could have saved the trouble buying with your money.